EVENTS – Page 3 – TIMBER SHOP / 팀버샵 :: 스케이트보드, 스케이트보드 샵, 크루져보드, 롱보드, 페니보드. 당신의 로컬 스케이트보드샵 2012년부터 로컬 스케이트씬을 서포트 해오고 있습니다. Your Local Skateboard Shop supporting the local scene since 2012. GX1000 SEOUL PREMIERE @TIMBER SHOP HIGHLIGHTS! GX1000 SEOUL PREMIERE @ TIMBERSHOP !!! SKATE NIGHT #18 – DC SHOES ‘DE LA CALLE/DA RUA’ VIDEO PREMIERE! DC Shoes 브라질팀의 새로운 비디오 ‘De La Calle/Da Rua’ 시사회로 여러분을 초대합니다! 전 세계적인 브라질 스케이터들의 초강세 속에 그 이유를 한 눈에 확인해볼 수 있는 이번 비디오는 추위에 잠시 움추러든 여러분의 마음을 따듯하게 녹여줄 것이 분명합니다. ※ 이 날 시사회에 오시는 분들에게는 간단한 맥주&음료 그리고 스낵이 제공될 예정이며 경품 추첨을 통해 DC Shoes 및 Timbershop에서 준비한 complete등 다양한 상품으로 증정합니다. Kadence in partnership with DC Korea, would like to invite you to the DC ‘De La Calle / Da Rua’ Korea Video Premiere at the Timber Shop this Friday Night starting at 6PM! Free Beer & Snacks will be provided for anyone attending the event, plus a DC product toss for Shoes and other goodies compliments of DC Korea! 올해로 5회째를 맞은 KOREA STYLE WEEK가 삼성동의 코엑스에서 성황리에 열렸다. 2015년을 이끌 다양한 스타일을 제안하는 코스윅에서 우리가 주목할만한 점은 지난해 작은 부대행사로 그쳤던 스케이트보드 이벤트가 이번 해에는 행사장의 한켠을 크게 차지하여 이에 따른 다양한 스케이트보드 이벤트들이 진행되었다는 점이다. 가로 / 세로 각각 20여미터의 스케이트보드 행사장은 추위로 움추려있던 스케이터들의 갈증을 풀어줄만한 장소로 마련되었다. 레드불에서 제공한 다양한 기물들에서 스케이터들은 오랫만에 땀을 흘리며 스케잇할 수 있었고 이를 위해 BLQLTS 레이블의 DJ들이 멋진 음악들을 들려주었다. 코스윅 행사기간내내 스케이트보드존에서는 관람객들의 눈길을 끌만한 다양한 부대행사들이 주말내내 이어졌다. Jason Choi와 케이던스 소속 스케이터들이 진행하는 스케이트보드 레슨과 데모쇼가 하루 2회씩 진행되어 관람객들이 스케이트보드를 눈으로, 그리고 직접 즐길 수 있는 자리가 마련되었고, 주말에는 특별히 스케이트보드 림보와 알리높이뛰기 이벤트가 진행되어 스케이트보드의 다양한 모습들을 일반 관람객들에게 보여줄 수 있는 좋은 자리가 마련 되기도 하였다. 행사기간내내 코스윅의 스케이트보드존은 수많은 스케이터들이 방문하여 관람객들의 많은 관심을 이끌어내었다. 이렇듯 앞으로 이와같은 일반 대중들이 스케이트보드를 접할 수 있는 더욱 많은 이벤트가 생기게되길 바라는 마음이다. 그리고 올해 좋은 반응을 얻은 만큼 다음 코스윅에서의 더욱 거대해진 스케이트보드 이벤트 역시 기대해본다. Check out all the highlights from Korea Style Week which featured everything from demos by the Kadence Distribution Skate Team, skate lessons, ollie and limbo contests and much more! Big thanks to Red Bull, InStance Korea, KLIQ stores, Dailygrind and Kadence Distribution for this successful event! 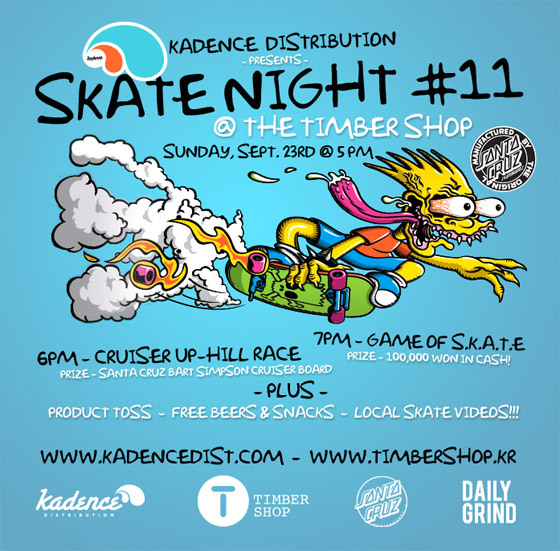 MADVICTOR X TIMBER SHOP (MADTIM) LAUNCH PARTY! We are super excited to say that our boys over at Madvictor have come through and painted the shutters at Timbershop. And there’s more in the works! Peep the vid to check out the process and maybe catch a glimpse of what’s coming in the future. MAD TEAM. 걸 스케이트보드, 라카이 풋웨어 그리고 케이덴스 디스트리뷰션이 협찬한 RAMP JAM 2013 서울의 한양대역 스케이트 공원에서 열렸습니다. 이번 이벤트를 큰 성공으로 이끌게 해준 데일리 그라인드, 레드불 코리아, 언성 매거진, 그리고 팀버샵에 깊은 감사를 드립니다. 우승하신 모든 분들께 다시 한번 축하를 드리고 또한 모든 참가자들과 로걸씬을 서포트 하는 여러분들께 다시 한번 감사를 드립니다! RAMP JAM 2013 was held at Hanyang University Skate Park in Seoul, Korea and was presented by Kadence Distribution, Girl & Chocolate Skateboards and Lakai Footwear. 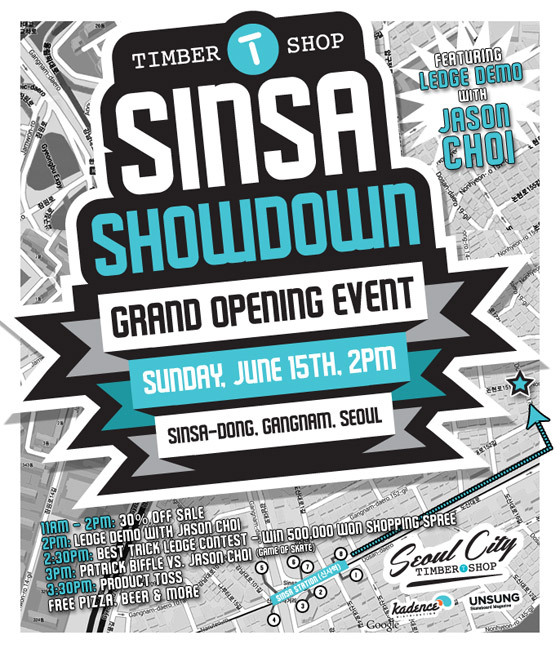 Big thanks to Dailygrind, Red Bull Korea, Unsung Magazine and the Timber Shop who were all strong supporters and helped to make this event a huge success!!! Congratulations to the winners and big thanks to everyone who participated and to all who just came out to support their local scene! Fallen – A Road Less Travelled Seoul Premiere! Heroin Video Premiere – Seoul, Korea!